The Rangers won in Edmonton last night for the first time in 10 years in their 4-2 win. Game recap is here. The Oilers came into the game with a laundry list of missing players due to injuries or the flu. With the home team undermanned, there was no reason for the Rangers to fail to exploit the opportunity to come away with 2 points on the road. Fortunately, they understood that and performed. Due to the recent rash of injuries, Oiler management is looking into putting a plow on front so that ambulances can be used as a Zamboni. Led by a revived power play that produced 3 goals and with goals from Ryan Callahan (his first in 11 games) and another goal from the awakening Christopher Higgins, the offense looked a bit more potent than recently. Ales Kotalik had 3 points thanks to a goal and two assists. The Rangers scoring was spread out as 8 different players had points. It is obvious that the recent emphasis on playing better defense is starting to pay off as the Rangers dominated territorial play for most of the game and did a much better job of clearing rebounds in front of the net. The usual contributors scored points last night. . .
Captain, but his defensive work was again stellar. The Rangers grabbed a lead they did not relinquish with 5 minutes left in the first period. They dominated the game for great stretches especially when Aaron Voros was not on the ice taking stupid penalties. The penalty kill was outstanding as the Oilers had difficulty generating much offense when they had 4 straight power play opportunities over the course of 20 minutes starting with the 5 minute mark of the first period. The Blueshirts were able to maintain their 1-0 lead and then build on it as they capitalized on the PP during the final 40 minutes. Steve Valiquette bordered on stupendous at times as he made 26 saves. He stood tall most of the time and played the angles well. His glove hand, except for a wonderful snag of a slapshot, was a little weak as he kept dropping pucks. He also left a number of juicy rebounds but the Rangers defense swarmed to clear them away effectively. His Oilers' counterpart, Nikolai Khabibulin, deserved a better fate. The Rangers launched more than 60 shots at the net. 4 found the net, 35 were saved, and the remainder either were blocked or missed the net completely. The Rangers' 39 shots on goal was their largest output of the season. What I found interesting about the Rangers' approach to this game was their stick work. They made numerous stick checks on Oiler players in the neutral zone or during rushes into the offensive zone. This tactic frustrated the Oilers and broke their momentum especially during the power play. The Rangers defensemen, particularly, the youths (Del Zotto & Gilroy) and Girardi and Staal were particularly effective. Also effective (early on) was the 4th line combination of Boyle, Avery and Voros. At the beginning of the game, their forecheck was breaking the will of the Oilers. Unfortunately, some sloppy stick work by Voros led to 2 consecutive penalties that broke the Rangers' momentum and gave Voros a seat in the coach's doghouse for an extra 20 minutes. This must have annoyed Tortorella to no end. Still, the forechecking was there during the first period and led to Higgins scoring on a nice feed from Matt Gilroy (who played an excellent game all night long) with 4:32 remaining in the first period. The effective stick work was not only on the defensive end. On offense, Ranger forwards had their sticks on the ice looking for passes and possible deflections. Early in the first period, Girardi took what looked to be a shot from the point, but in fact, it was a pass to Avery in front who nearly deflected the puck into the net. Reminiscent of Paul Mara's assists during power plays. In fact their overall aggressiveness on both ends of the ice was evident as the Rangers outshot the Oilers 14-8 in the first period (and 28-18 after 2 periods), even though the Oilers had 3 straight power play opportunities. It was a sign of good things to come this game. 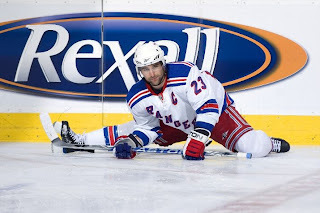 Another positive is the Rangers' continued ability to make crisper passes during power plays. Last year, an inordinate number of cross ice passes were stolen, leading to more successful short handed opportunities than we want to remember. This year, the passes are not being stolen and are keeping the defense off balance. During the Rangers' 2nd power play, Del Zotto made a nifty pass that Callahan deflected over Khabibulin's shoulder to put the Rangers ahead 2-0. That goal was Ryan's first in 11 games and broke an 0-for-12 power play drought for the team. About 3 minutes after the Oilers scored cut the deficit to 2-1, on another power play, the Rangers passed the puck around the zone confidently and did not let the Oilers set up. Finally, Marian Gaborik found Ales Kotalik at the left point who fired a bullet that made its way past Khabibulin to restore a 2 goal lead heading into the 3rd period. That may have been the turning point of the game. Based on recent history with Valiquette in goal on the road with the Rangers ahead, there was cause for concern. However, the Oilers quickly helped the Rangers' cause when Fernando Pisani high-sticked Del Zotto for a 4 minute double minor. 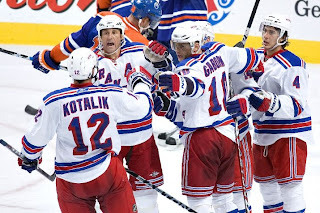 The Rangers were able to extend their lead on a nice tip-in play by Gaborik after another Kotalik blast from the point with 12 1/2 minutes left to convert the Rangers 3rd power play goal of the evening. Even though the Oilers did score with 7 minutes to go, the Rangers defended their advantage well even when the Oilers pulled their goalie with about 2 minutes to go. The Oilers overall played a ragged game. The Rangers certainly did not catch the Oilers playing their "A" game and took necessary advantage. Thanks to the t.v. angles, you could see how the Oilers left the center area between the circles in front of Khabibulin vulnerable throughout the game. There also were several times when 3 of their players were behind the net that helped the Rangers forechecking and preventing the Oilers from gaining any defensive presence. I wonder how former coach Tom Renney felt as he saw the Rangers blend defense, forechecking, penalty killing and power play prowess so effectively in one game. The Rangers conclude their western tour of Canada with a trip to Calgary to face the 9-4-1 Flames on Saturday night. This game will be a good indicator as to whether the offense is now returning to its early season form and whether the continued reliance on defense can be maintained. 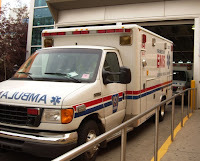 Terrific post GMantis...the ambulance zamboni pix had me in stitches.. I wonder if you all felt bad for Tom Renney, as I did watching the game. Not only because he was having to watch a bionic team with strengths that he was never able to manage (well...the leftover six players from his team that is..), but moreso because he was THE ASSISTANT coach of the Oilers -- second in command. If you watched the MSG feed that I did, they kept painting this picture of 'how Renney was going to feel' or 'the return of the RANGERS' and putting him on the spot with the camera. Anyhoo, the Blueshirts looked good last night...a complete game and still continually impressed with the young'ens.. Hoping for 2 of 3 on the west coast swing.. I had at least a couple of miscues -- the 4 minute major and not giving Kotalik an extra assist (check my math there). I made the changes and appreciate the comments. Cool new look, Dude! Easier to read.